The Water Sciences Laboratory is a 6,000 square-foot facility located at the University of Nebraska-Lincoln's East Campus. The building consists of six laboratories dedicated to environmental mass spectrometry , stable isotope and noble gas analyses, and standard analytical methods for water quality each with instrumentation dedicated to specialized protocols. Read more about the dedicated instrumentation for our analytical methods below. Mass spectrometry is the most widely used analytical tool for environmental analyses due to their sensitivity, reliability, and versitility. Instrumentation in the Water Sciences Laboratory is used for developing and applying methods to accurately measure very low concentrations of organic contaminants such as pesticides, munitions waste, both steroids and veterinary pharmaceuticals/antibiotics from concentrated animal feeding operations (CAFOs), algal toxins, gasoline additives, and degradation products in a wide variety of matrices. Many new methods have been developed in this facility using state-of-the-art instrumentation for analysis of various chemical species such as arsenic, selenium, iron and emerging contaminants like glyphosate and its metabolites. 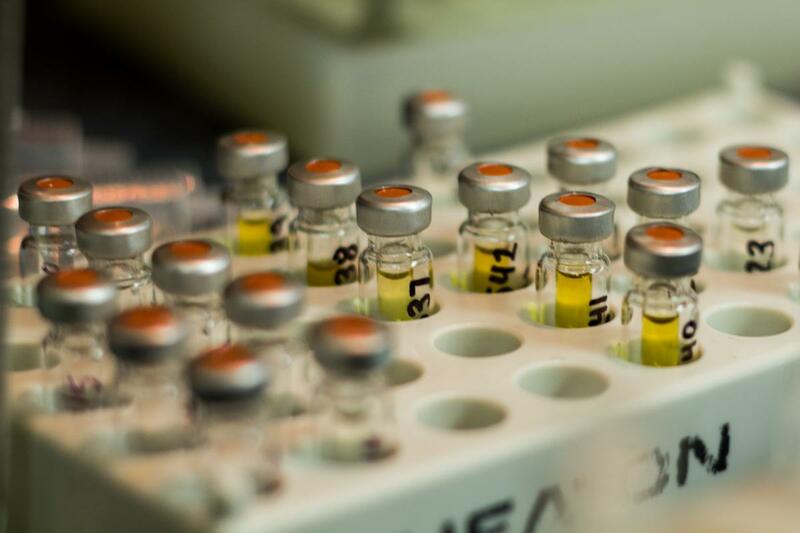 Many new methods have been developed in this facility using state-of-the-art instrumentation for analysis of these and other emerging contaminants. Hewlett Packard 5972 Gas chromatograph/mass spectrometer is the primary instrument used for trace level pesticide analysis. Micromass Quattro Micro Triple quadrupole liquid chromatograph/mass spectrometer is a state-of-the-art instrument capable of highly sensitive and selective analysis of polar (water soluble) organics such as explosives, pharmaceuticals, hormones, surfactants and other emerging contaminants. A Spark Holland Symbiosys Environ online extraction system was later added to allow more rapid extraction and analysis of samples for this instrument. This capability has also lead to even more sensitivity in methods developed through this technology because of the ability to easily concentrate and immediately analyze contaminants. Agilent 5973 Gas chromatograph/mass spectrometer has both electron and chemical ionization sources and a newly designed inert source that improves sensitivity by an order of magnitude. This GC/MS was installed with a Leap CombiPAL autosampler that permits automated headspace and solid phase microextraction in addition to the traditional liquid solvent injection of samples. This instrument is used for gasoline oxygenate analysis, along with methods for volatile organics and pesticides. An OI purge and trap autosampler, was installed on this instrument for analysis of volatile organics. Thermo Dionex IC 5000+ iCAP RQ ICP MS is a hybrid instrument that has an ion chromatography system attached with the inductively coupled plasma mass spectrometer. Its comprehensive interference removal assures data accuracy, while its innovative helium Kinetic Energy Discrimination (He KED) technology enables measurement of analytes in a single mode. This versatile instrument maximizes productivity and robustness with high sensitivity. It is capable of measuring trace levels of metal, metal species and polar pesticides such as glyphosate and its metabolites.. Elements often have different chemical forms or masses (i.e. isotopes), that vary in abundance. Stable isotope analysis focuses on high precision measurements of naturally occurring isotopes of hydrogen, carbon, nitrogen, and oxygen. Natural variations of the abundance of these isotopes can help discover the origin and flow of these elements in the environment. Stable isotope analysis often “fingerprints” sources of contaminants such as nitrate and can also be used in studying chemical reactions and metabolic processes. 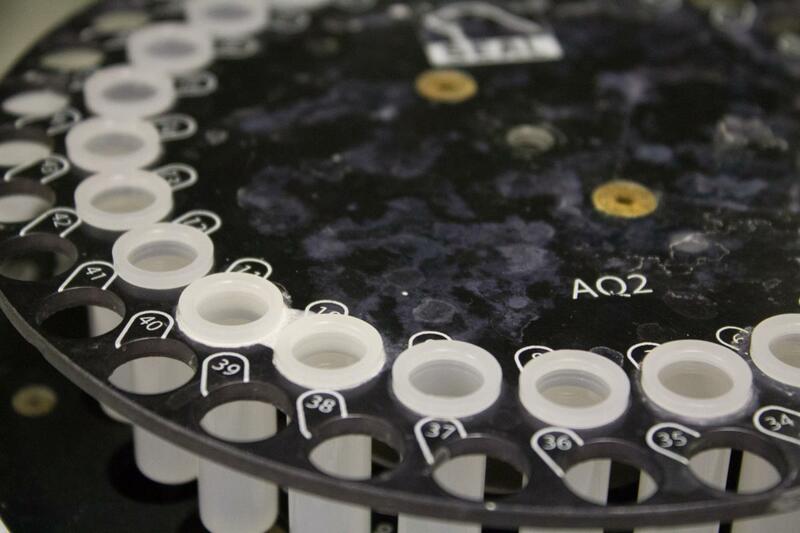 The WSL offers methods for stable isotope analysis of gases, water, and solids. The lab is well known for its methods for determination of the isotopic composition of nitrate and ammonia nitrogen to support the investigation of nitrate contamination of groundwater and environmental fate and transportation. VG Optima dual inlet isotope ratio mass spectrometer is the primary instrument available for nitrogen isotope work, but may also be used for hydrogen, carbon and oxygen analyses. Its dual inlet and cryo-focusing capability provide the high sensitivity required for small (micromole) samples. AP2003 with Isoprep is a continuous flow isotope ratio mass spectrometer with a computer-controlled system enabling automated preparation and analysis of water and gas samples for carbon-13 and oxygen-18 analysis. A second automated sample preparation system, the Isoprep C, was added to expand this capability to rapid analysis of carbonate samples. GV Isoprime continuous flow mass spectrometer with a Eurovector PyrOH elemental analyzer using a chromium reduction furnace designed for automated high-precision determination of the deuterium content of water. 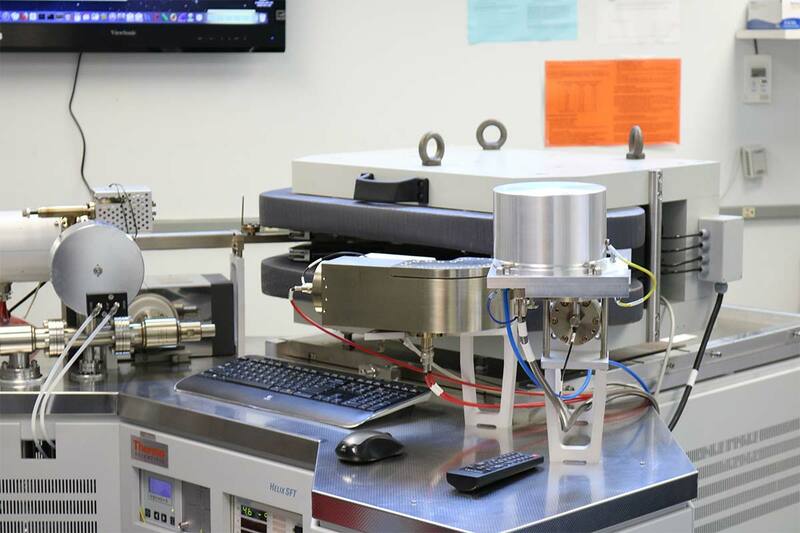 A second Eurovector solids elemental analyzer was added to expand this capability to analysis of deuterium, carbon, nitrogen and oxygen isotopes in solids (plants, salts, sediments). GV Isoprime dual inlet isotope ratio mass spectrometer is state-of-the-art for small sample stable isotope analysis and will be used for both nitrogen and carbonate stable isotope analysis where high sensitivity is required. Helix SFT noble gas mass spectrometer and extraction system is a custom-built, automated, and ultrahigh vacuum system where noble gases (helium-3, helium-4, neon, argon, krypton, and neon) and nitrogen are quantitatively extracted from water samples collected in sealed copper tubes. Gases are cryogenicallyseparated using two ultralow temperature traps (10 and 24 degrees Kelvin) and subsequently quantified on a Thermo Helix SFT noble gas mass spectrometer, Hiden RCF 1.2 quadrupole mass spectrometer, and MKS capacitance manometers. The system is also capable of determining low level tritium (3H) activity in water by ingrowth and measurement of low level helium-3. The system is dedicated to age dating young groundwater following the tritium/helium-3 method and is based on the system design described in Stanley et al. (2009). The WSL provides sampling copper tubes and equipment needed to properly collect and preserve samples for age dating as described in Aeschbach-Hertig and Solomon (2013) as part of the service fee. Used for preparation of water samples for trace organics analysis, and for analysis of water using ion chromatography, spectrophotometry, and automated analyzers. Dionex ICS-90 Ion Chromatograph with PeakNet data system is the primary instrument for analysis of major anions. Seal AQ2 Autoanalyzer is a new generation of autoanalyzer used for rapid and precise colorimetric analysis of hundreds of water samples for ammonia, nitrate, phosphorus and other water quality parameters. Lachat 8500 Quikchem Flow Injection Autoanalyer (FIA) is used for high throughput and low cost nutrient (nitrate, phosphate, ammonian, TN) analysis in water and soil extracts. Ol Model 1010 Carbon Analyzer with autosampler is used for automated analysis of organic carbon in water. Perkin Elmer AAnalyst 400 Spectrophotometer is primarily used for determination of cations and dissolved elements. Labconco RapidVap Concentrator is used for evaporating solvents.